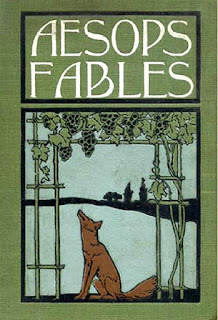 There are several editions of Aesop's Fables at manybooks.com. I was surprised at how many of the familiar morals I remembered having forgotten their source. The volume I've linked doesn't include illustrations but there are many online that do including this one from which I appropriated those below. A Lion was awakened from sleep by a Mouse running over his face. 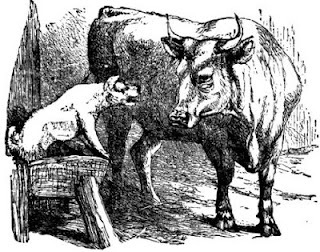 Rising up in anger, he caught him and was about to kill him, when the Mouse piteously entreated, saying: "If you would only spare my life, I would be sure to repay your kindness." The Lion laughed and let him go. It happened shortly after this that the Lion was caught by some hunters, who bound him by strong ropes to the ground. 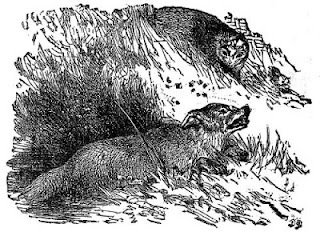 The Mouse, recognizing his roar, came up and gnawed the rope with his teeth, and, setting him free, exclaimed: "You ridiculed the idea of my ever being able to help you, not expecting to receive from me any repayment of your favor; but now you know that it is possible for even a Mouse to confer benefits on a Lion." No one is too weak to do good. 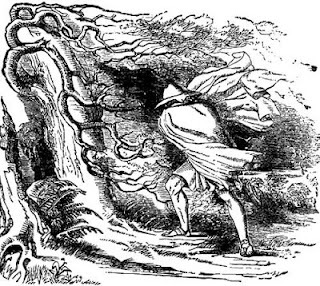 The North Wind and the Sun disputed which was the more powerful, and agreed that he should be declared the victor who could first strip a wayfaring man of his clothes. The North Wind first tried his power, and blew with all his might; but the keener became his blasts, the closer the Traveler wrapped his cloak around him, till at last, resigning all hope of victory, he called upon the Sun to see what he could do. The Sun suddenly shone out with all his warmth. The Traveler no sooner felt his genial rays than he took off one garment after another, and at last, fairly overcome with heat, undressed, and bathed in a stream that lay in his path. We should not deprive others of blessings because we cannot enjoy them ourselves. A Shepherd-boy, who watched a flock of sheep near a village, brought out the villagers three or four times by crying out, "Wolf! Wolf!" and when his neighbors came to help him, laughed at them for their pains. The Wolf, however, did truly come at last. The Shepherd-boy, now really alarmed, shouted in an agony of terror: "Pray, do come and help me; the Wolf is killing the sheep;" but no one paid any heed to his cries. A Fox, while crossing over a river, was driven by the stream into a narrow gorge, and lay there for a long time unable to get out, covered with myriads of horse-flies that had fastened themselves upon him. A Hedgehog, who was wandering in that direction, saw him, and taking compassion on him, asked him if he should drive away the flies that were so tormenting him. But the Fox begged him to do nothing of the sort. "Why not?" asked the Hedgehog. 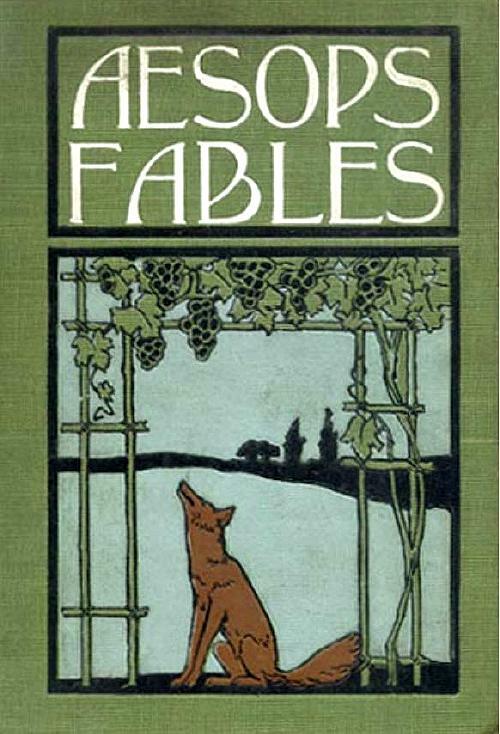 "Because," replied the Fox, "these flies that are upon me now are already full, and draw but little blood, but should you remove them, a swarm of fresh and hungry ones will come, who will not leave a drop of blood in my body." When we throw off rulers or dependents, who have already made the most of us, we do but, for the most part, lay ourselves open to others, who will make us bleed yet more freely.